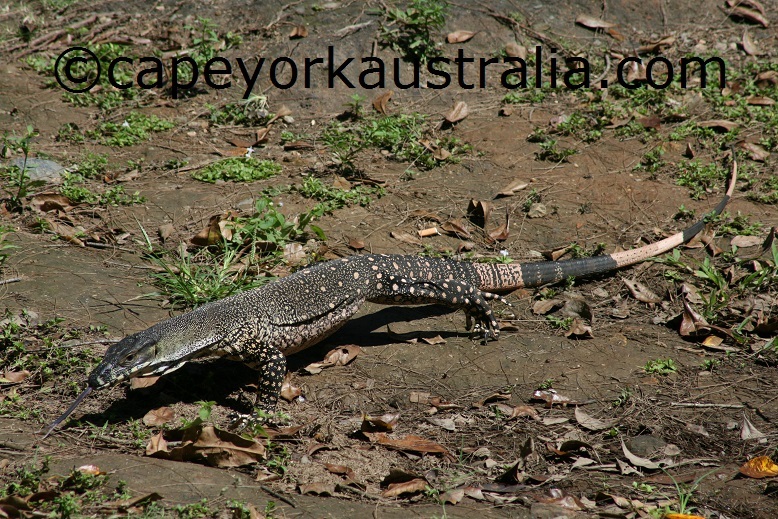 Monitor lizards are the most impressive lizards in Australia. They are large, slow moving, quite easy to spot and beautiful to watch; they are also called goannas, and there are 24 species in Australia. They have strong feet, long necks, slender heads, and forked tongues - unlike all other lizards. 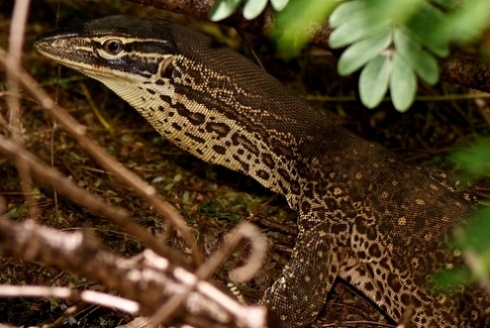 The largest in the world are komodo dragons, the largest in Australia are perenties, our largest one is lace monitor - the second largest goanna in Australia. 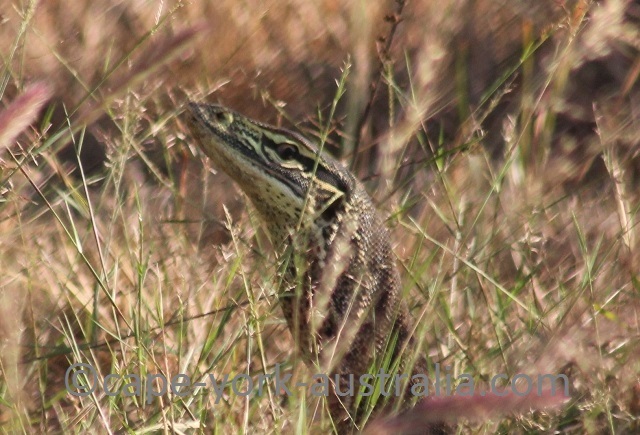 Sand goanna is one of the most widespread and abundant of all Australian monitor lizards. 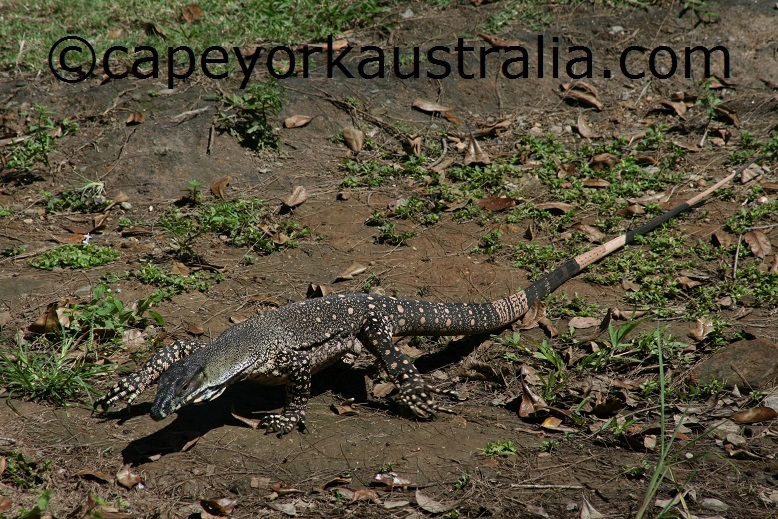 It is a fairly large lizard, and as opposed to many other monitor lizards, it is ground dwelling (not found in trees). 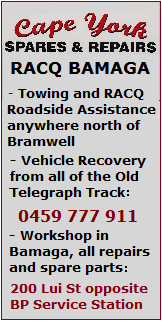 It is only found in south eastern parts of Cape York peninsula (Lakefield and south). 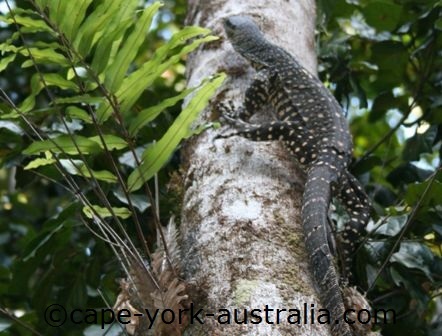 Yellow spotted monitor can look similar to sand goannas (except it has dark bands on tail tip and bands of dark spots on belly), and it can also be found in a similar habitat - on the ground and not in trees. In north Queensland, it is found from Cairns in the north roughly to Mackay in the south. Spotted tree monitor lives up in trees. It has a dark, grey to black body, with cream coloured spots, and the tail has a banded pattern. It lives in open forests and rainforests in northern and eastern Australia. In Cape York, it is found in Cedar Bay National Park and Home Rule, south of Cooktown. Storr's monitor has a reddish brown body with dark centered cream coloured spots, and the pattern continues to the tail (no bands on tail). It lives in rocky areas and open forest in a patchy distribution across northern Australia. 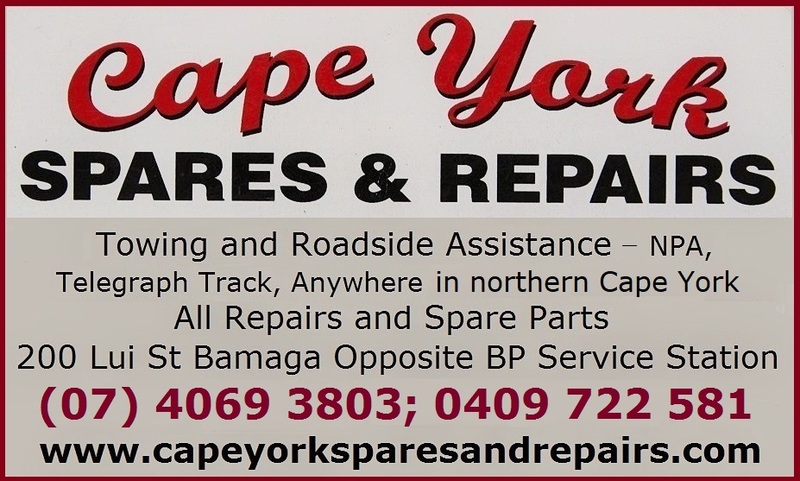 In the Cape York area it is found at Archer Point and Lappa Junction. Rusty monitor also has a spotted body, but a pattern with bands across the tail. It is fairly large and has a brownish grey to black body. It lives in coastal swamps and mangroves in a patchy distribution between Cape York peninsula in the north and Gladstone in the south. Black tailed monitor is one of Australia's larger monitor lizards, with a dark, brown to black body with dark centered creamy spots on the head and body, and narrow bands on the tail. It is found in most of Australia except the south and south east. In the Cape York area, it is found south of Cooktown. 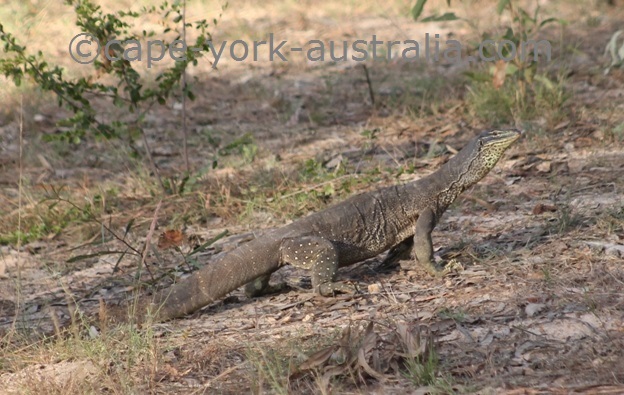 And finally, the largest of them all in Cape York, and the second largest in Australia (after perentie), lace monitor is an impressive two metres long lizard with a dotted body and banded tail. It lives in closed and open forest and woodland in coastal Australia, in Cape York it is found south of Cape Melville. Sand goanna is a large, impressive lizard. It is actually not found in most parts of the Cape York peninsula, only in the south east - south of, and including Lakefield National Park, which - as opposed to the northern parts of the peninsula - is a real hot spot for them. It can look similar to lace monitor, and it is a kind of monitor lizard. Goanna is the name often used to refer to Australian (and some Asian) monitor lizards, of which there are about 25 (30 with the Asian) species. 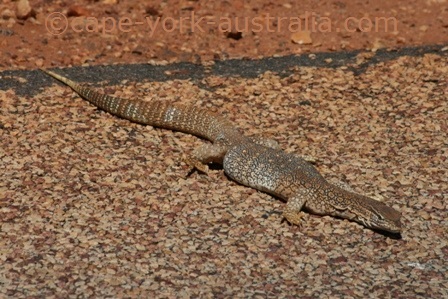 There are two subspecies of sand goanna: Gould's Goanna Varanus gouldii gouldii, and Desert Sand Monitor Varanus gouldii flavirufus. Goulds monitor Varanus gouldii gouldii near Jowalbinna. The first lives largely in northern and eastern Australia, while the latter lives in the arid inland Australia. The ranges of the two also overlap, and confuse, as the two are not always so easy to distinguish from each other. Goulds monitor Varanus gouldii gouldii in Lakefield NP. All photos subject to Copyright - do not copy. Borth can also, at first glance, be confused with the lace monitor. 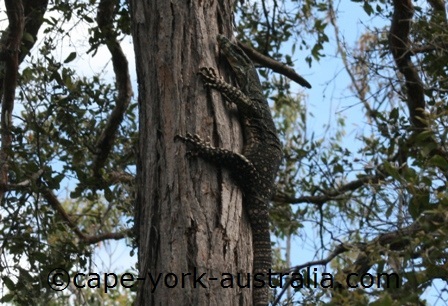 Lace monitor is arboreal and will take off to the trees if disturbed. 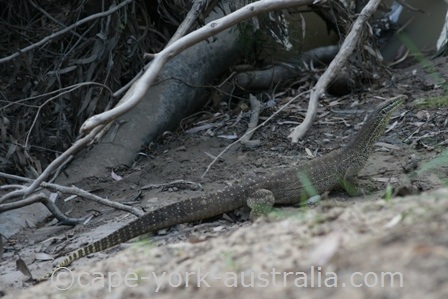 Sand goanna is ground dwelling and digs holes in the sand or soil, where it will seek protection. Gould's monitor Varanus gouldii gouldii is a fairly large lizard, at 1.4 metres in length in average, and a weight of up tp 6kg. Goulds monitor Varanus gouldii gouldii. All photos subject to Copyright - do not copy. It lives in grasslands and woodlands in the eastern and northern Australia, and shelters in burrows, tree hollows and rock crevices. 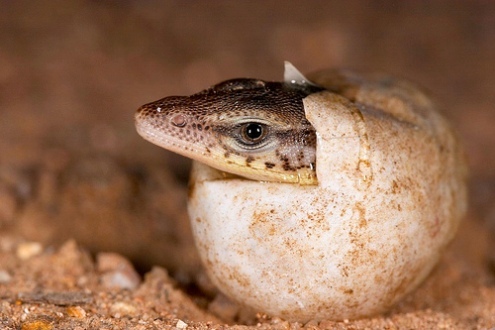 It is believed to be the most abundant of all Australian monitor lizards. Desert sand goanna Varanus gouldii flavirufus, lives more in the central Australian sandy deserts and the outback. Desert sand goanna Varanus gouldii flavirufus. Both are mainly diurnal (active during the day time). Both are carnivores, thus predators, and they feed on rodents, large insects and other reptiles. Both also eat carrion as well as eggs of birds and other reptiles. They lay eggs in termite mounds, which they first dig a hole into, then let the termites to repair it, leaving the eggs inside. Once the eggs are ready to hatch they return and dig the mound open again. 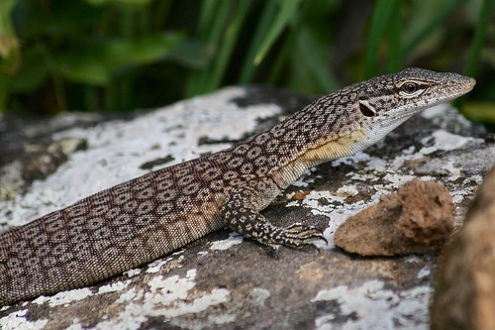 Juveniles eat insects and small reptiles. Lace monitor is one impressive lizard. 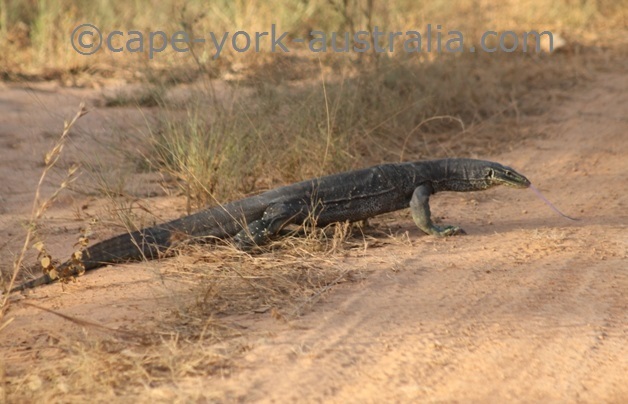 It is the largest goanna lizard in Cape York and the second largest in Australia (after perentie which we don't have). It is great to watch as it walks on the ground looking for food, but it spends most of the time up in the trees so your chances to see it up there are much better. It is up to two metres long, has a distinctive colouring and a forked tongue like a snake's. It is the only lizard to have a forked tongue. They are found in eastern Australia, from Cape Bedford on Cape York peninsula in the north, to eastern South Australia in the south. It is dark grey or brown with lighter, cream or yellowish spots. Its underside is pale. The rarer, Bell's Form (often found in dryer habitat in Queensland and New South Wales) has large brown and pinkish stripes across its body. They all have strong legs and claws that are used for climbing in trees. A wild Lace Monitor with tongue out, Lake Placid, Cairns. They live in forests, open woodlands and coastal tablelands, where they forage on the ground and seek safety and shelter up in trees. They hide from cool weather in tree hollows, under rocks and under fallen trees. They can walk up to three kilometres a day while foraging. They eat insects, reptiles, birds, eggs, small mammals, and carrions. They also come to people's homes and farms and eat garbage, chicken eggs and chicks, and whatever else they can get hold on. They attack marine turtle and bush turkey nests to eat their eggs. They are active during the warmer months of the year, and their breeding season is the build-up season and early Wet - the hottest time of the year. They lay their eggs in termite mounds, where they make a hole for the eggs and then leave the hole for termites to repair. That will keep the eggs warm and safe until the female goes back and digs them out again once the eggs are ready to hatch. Lace monitors are harmless however they can bite and some studies have even shown that they may have some poison.